Ivy scales the porch and cobblestone siding of the artist Charles Morris Young’s home as snow melts on the grass and hedges on his front garden. Young’s painting portrays the house amidst the natural landscape, connecting the domestic and natural as continuities with one another. Sunlight shines on the house from an unseen source as trees reach skyward on an early winter morning. Intermittently, vivid shades of green appear in the grass, hedges, ivy, and shutters, deepening the roots of the house to the surrounding landscape. Young’s influences included Daniel Garber, his teacher at the Pennsylvania Academy of Fine Arts country satellite in Chester Springs. French influence echoes in Young’s use of color, while each brushstroke forges a naturalistic composition. Walter Emerson Baum carried Impressionist landscape painting into Lehigh County, where he also set up the Allentown Art Museum and Baum School of Art. 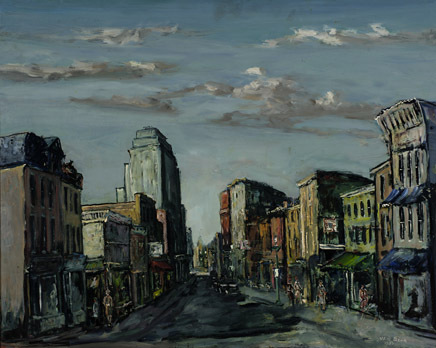 By the 1940s, Impressionism had fallen out of popularity, but the bold colors of the French Avant-Garde breathe vitality into this mid-century American street in the awnings and painted sidings of Baum’s Quaint Street. The colors Baum uses here are not arbitrarily applied like Matisse might, but deliver a sense of small-town charm and sweetness. The dark blue wash of the street in shadow evaporates into the bright blue sky through the narrowing space between blocks. The oil-tempera’s thickness and opacity makes the picture plane nearly sculptural. Baum reveals the beauty of the village as light, development, and occupancy change. In this painting, artist Daniel Garber spreads blue oil paint upon brown, coal, and orange hues to feign the jagged surfaces of rock and water. These compositional ideas stem from notes and studies made at the site after the artist returned to the studio. He applies washes of color to create depth and texture upon a flat canvas surface, managing to capture a moment of stillness. 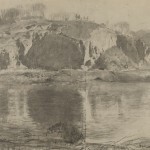 A charcoal study done at the banks of the Delaware River in Limeport, Pennsylvania, is fully realized in this painting. The reflective surface of the water contains a sense of tranquility but is quite still beside the undulating surface of the quarried rock. 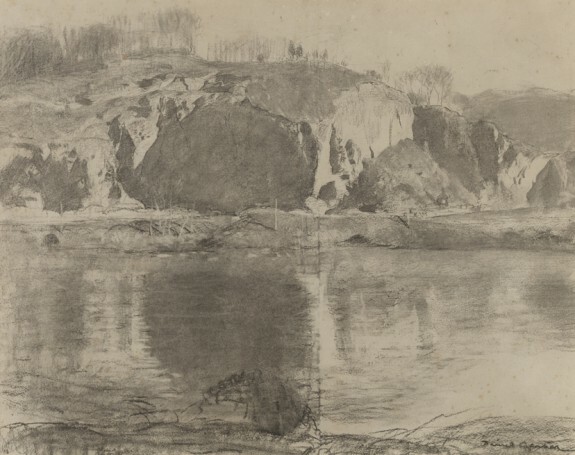 Garber indicates a familiar tension between land and water that memorializes the regional landscape of southeastern Pennsylvania. Among the winter scenes popularized by the New Hope art colony were nights like this one by John Folinsbee. 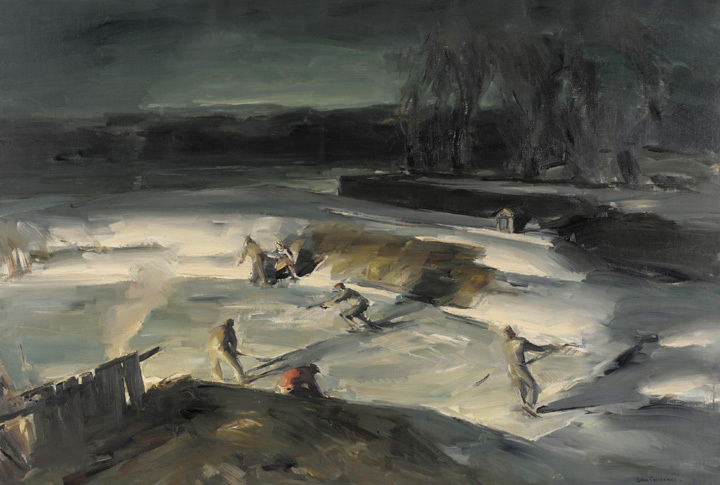 His observations of nature are captured in the sweep of a palette knife, further suggesting the form and movement of his subjects in smaller brushstrokes. 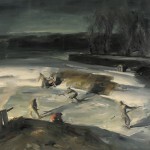 In this painting, titled Dark Hollow, the plein-air (open air) and light-capturing techniques of French Impressionism are translated to the whirling pace of ice skaters, who are illuminated by a nearby campfire. Rather than the beaming lampposts of the Parisian avenue, Folinsbee employs a smoky fire at bottom-left to expose their nighttime play. Their shadows appear on the frozen lake, mingling with the colors of its murky water beneath the surface. Their outerwear distinguishes their form from the snow and ice, especially the red coat of the subject sitting center-left who perhaps laces his skates. Folinsbee’s contemporary works to Dark Hollow ponder the fickleness of light as it changes from bright, to overcast, from dark, to morning as it breaks over the horizon. His skaters seem to have played through the changes in daylight during an unending game of hockey. Pennsylvania Impressionist painting flourished in eastern Pennsylvania in the first half of the twentieth century. 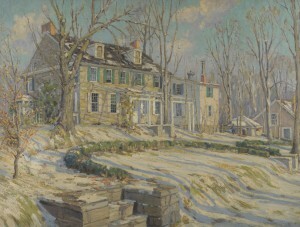 Often referred to as the “New Hope School” because artists in Bucks County produced the best-known works, the style was also practiced vigorously in Montgomery, Chester, Delaware, and Lehigh Counties, and key artists of the movement taught at the Pennsylvania Academy of the Fine Arts in Philadelphia. In comparison to the impressionism being practiced in other parts of the United States, Pennsylvania Impressionism was characterized by its thick brushwork and its almost single-minded focus on landscape painting. Pennsylvania Impressionism began with the settlement of the painters William Langson Lathrop (1859-1938) and Edward Redfield (1869-1965) in the picturesque village of New Hope, along the banks of the Delaware River, in 1898. 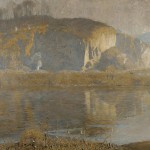 Within a few years, these two men had gathered around themselves a group of artists who sought to combine the innovations of the French Impressionists, especially their interest in capturing light and plein-air painting—or painting outdoors—and their focus on the themes of everyday modern life, with an interest in American subject matter. Walter Elmer Schofield (1867-1944), George Sotter (1879-1953), and Henry Snell (1858-1943) visited Lathrop and Redfield in New Hope as early as 1902; and Daniel Garber (1880-1958) bought a house in Lumberville, just north of New Hope, in 1907, having discovered the property with the help of Will and Annie Lathrop. These artists were inspired by the relatively unspoiled landscape of Bucks County. They painted this section of the Delaware River Valley in all weather and in all seasons, each in his own unique way, but they were especially fond of depicting the area as it looked in winter. By 1915, when the New Hope art colony was at the height of its fame, Garber and Lathrop were nationally famous as teachers. Redfield’s habit of lashing a canvas to a tree during a winter storm, or of standing in knee-deep snow while he completed a canvas at one go became the stuff of legends. Garber and Lathrop received gold medals at the Panama-Pacific International Exposition of that year in San Francisco, and Redfield was given an entire room at the same exhibition, in which he exhibited 21 paintings. By that time, the group had come to include such luminaries as Robert Spencer (1879-1931), Rae Sloan Bredin (1881-1933), Fern Coppedge (1883-1951), Mary Elizabeth Price (1877-1965), John Folinsbee (1892-1972), and Harry Leith-Ross (1886-1973). This group of painters expanded the repertoire of the New Hope School by exploring brighter colors—as Coppedge did­­—and by delving into nighttime scenes—as did Folinsbee—and Spencer’s views of factories and tenement buildings. 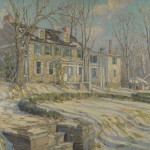 Pennsylvania Impressionism was also practiced seriously in the early twentieth century at Fort Washington, for instance, between 1900 and 1918. Thomas Anshutz and Hugh Henry Breckenridge (1870-1937) ran a summer art program called the Darby School of Art, which specialized in landscape painting in the impressionist mode. One of the Darby School’s first students was Daniel Garber. 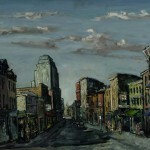 Another student was Maude Drein Bryant (1880-1946), who went on to become a key figure in the “Philadelphia Ten,” a powerful group of women artists who exhibited together from 1917 to 1945. Bryant eventually settled in Hendricks, Pennsylvania, in Upper Salford Township, and spread an appreciation for impressionism throughout upper Montgomery County. Pennsylvania Impressionism also thrived in Lehigh County, thanks to the efforts of Walter Emerson Baum (1884-1956), a Bucks County native who eventually founded the Allentown Art Museum and the Baum School of Art in Allentown. And Chester County became a locus of Pennsylvania Impressionism, too, when the Pennsylvania Academy of the Fine Arts set up its country school in Chester Springs, in 1917. Daniel Garber taught at Chester Springs, and some of the artists who came under his influence there included Mildred Bunting Miller (1892-1964), Grace M. Green (1904-1978), and Charles Morris Young (1869-1964). These artists worked in a style that often approached Fauvism, with its emphasis on bright and sometimes arbitrary color, but they stayed true to the Pennsylvania Impressionist preference for landscape paintings done with the same thick brushwork favored by the founders of the movement. The work of the Pennsylvania impressionists gradually went out of fashion in the 1930s and 1940s, giving way to modernist styles such as abstraction and cubism. It has regained popularity among collectors in recent decades, and their work has been the subject of a number of museum exhibitions and scholarly studies in the last few years. The exhibition entitled “Pennsylvania Impressionism,” which was held at the Michener Museum in Doylestown, Pennsylvania, in 2002 was accompanied by a catalog containing groundbreaking essays by Brian Peterson, William Gerdts, and Sylvia Yount. Pennsylvania Impressionism tends to be more “American” than other branches of American Impressionism, partly because it celebrated the American landscape so vigorously, and partly because it always retained the careful draftsmanship that most of its practitioners had learned at the Pennsylvania Academy of the Fine Arts. It was a hybrid of French and American ideas, and not a wholesale adoption of European ideas—as Boston and New York Impressionism were. Pennsylvania Impressionism helped Americans to become familiar with, in a gradual way, the many new artistic ideas that were coming from Europe in the late nineteenth and early twentieth centuries. Mark W. Sullivan earned a Ph. D. in Art History from Bryn Mawr College and specializes in American art and architecture. He has just published Picturing Thoreau: Henry David Thoreau in American Visual Culture (Lanham, Md. : Lexington Books, 2015), and is writing a book on Thomas Anshutz and Hugh Breckenridge, whose Darby School of Art in Fort Washington, Pennsylvania, was an important factor in the development of Pennsylvania Impressionism and American modernist painting. Gerdts, William H. American Impressionism. New York: Abbeville Press, 2001. Humphries, Lance. Daniel Garber: Catalogue Raisonne. New York: Hollis Taggart Galleries, 2006. Jensen, Kirsten. Folinsbee Considered. New York and Easthampton, Mass. : Hudson Hills Press, 2013. Kimmerle, Constance. Edward W. Redfield: Just Values and Fine Seeing. Philadelphia: University of Pennsylvania Press, 2004. Marley, Anna O., et al. The Artist’s Garden: American Impressionism and the Garden Movement. Philadelphia: University of Pennsylvania Press, 2014. Peterson, Brian, ed. 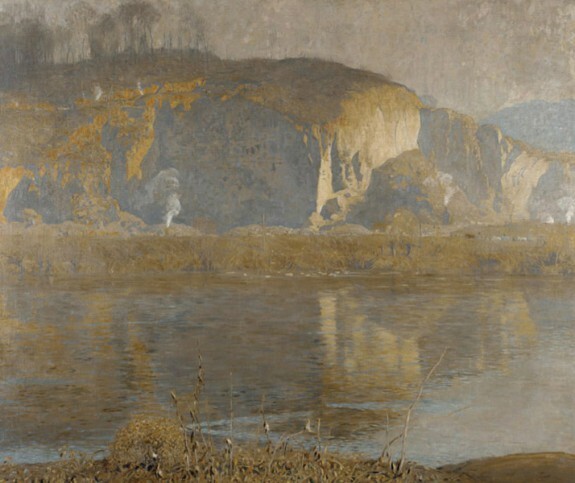 Intimate Vistas: The Poetic Landscapes of William Langson Lathrop. Doylestown, Pa.: James A. Michener Art Museum, 1999. Peterson, Brian, ed. Pennsylvania Impressionism. Philadelphia: James A. Michener Art Museum and University of Pennsylvania Press, 2002. Valerio, William, et al. Schofield: International Impressionist. Philadelphia: Woodmere Art Museum, 2014. Archives of the Pennsylvania Academy of the Fine Arts, 118 N. Broad Street, Philadelphia. Archives of the Michener Art Museum, 138 S. Pine Street, Doylestown, Pa.
Archives of the Philadelphia Sketch Club, 235 S. Camac Street, Philadelphia. James A. Michener Art Museum, 138 S. Pine St., Doylestown, Pa.
Avery Galleries, 100 Chetwynd Drive, Bryn Mawr, Pa.
Jim’s of Lambertville, 6 Bridge St., Lambertville, N.J.
Museum of American Art of the Pennsylvania Academy of the Fine Arts, 118 N. Broad St., Philadelphia. McCarty Gallery, 8401 Germantown Ave., Philadelphia. Allentown Art Museum of the Lehigh Valley, 31 N. Fifth Street, Allentown, Pa.
Newman Saunders Gallery, 120 Bloomingdale Avenue, Wayne, Pa.
Newman Galleries, 1625 Walnut Street, Philadelphia.